Positioned in the heart of Brisbane city, the multi-award winning Sofitel Brisbane Central is a luxury five star hotel renowned for its refined, personalised service with a signature French touch. Explore the very best of Brisbane and wander along our riverside walkways, artisan markets & designer malls. After a day of discovery, find comfort in your elegantly appointed room or suite and indulge in the finest amenities and gracious Sofitel service. Satiate the senses in one of our award-winning restaurants and bars, delight in Brisbane's brilliant weather by the outdoor pool deck or relax and unwind with an exquisite experience in Stephanies Spa Retreat. We invite you to savour the French art de vivre blended with our sophisticated local culture as you embark on a unique discovery of Brisbane. ..
Brisbane's largest fully-integrated conference venue. The hotel is above Central Station, with direct access to Brisbane Airport. Four award-winning restaurants and bars within the hotel offer endless choice. Three award-winning restaurants and a coffee and cocktail lounge offer endless choice. 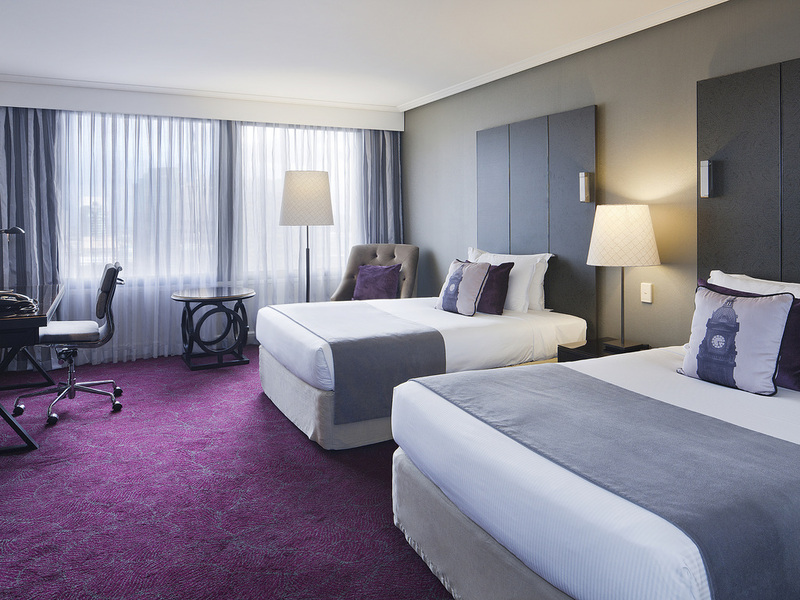 In a luxuriously chic setting, Sofitel Brisbane Central welcomes guests with heartfelt Queensland charm. Conveniently located above Central Station, arrive at ease and take a moment to relax, revel and rendezvous in our spacious open-plan lobby. Whether you're here for business or leisure, a sunbathed rooftop pool and spa and inspiring day and night views of the city and surrounding hinterland provide a breathtaking backdrop. Sofitel Brisbane Central tells the tale of two enchanting cities, embracing a wonderful blend of classic architecture and contemporary design. The city of Brisbane is your gateway to the sunshine state, where we showcase a love for the outdoors and a devotion to the arts, and where world class events happen year round, right on our very doorstep. Stretching along the river from which it takes its name, Brisbane offers modern architecture interspersed with lush gardens and unusual wildlife. Visit its shops and museums, or just stroll along its streets to experience the unhurried pace of Australia. From the airport, follow the city signs to Ann Street. Turn right onto Creek Street. Turn left immediately onto Wickham Terrace. Left onto Upper Edward Street, then left into Turbot Street. Air Train service direct to the airport from Central Station, located beneath the hotel. The hotel's onsite car-park has self-park (AUD 47 per 24 hours) or valet options (AUD 57 per 24 hours) for in house guests. Maximum vehicle height: 1.95 meters. 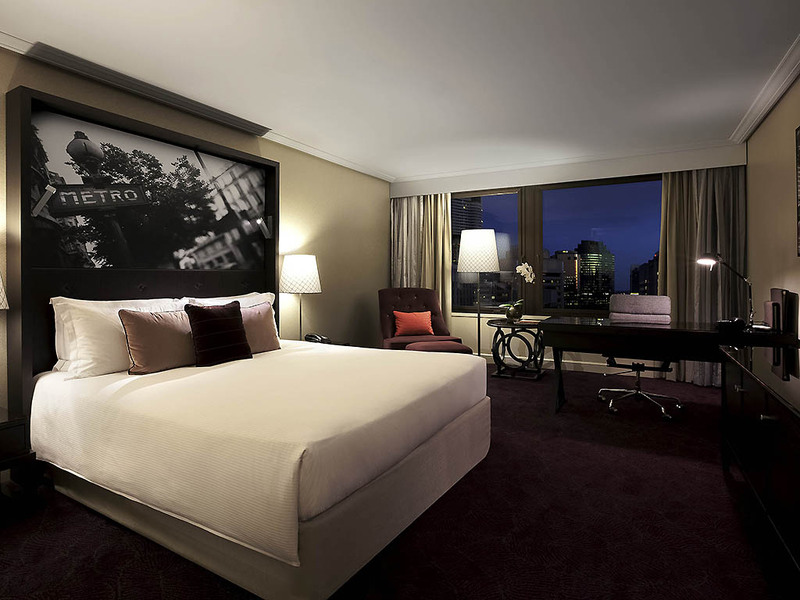 Sofitel Brisbane Central provides a retreat from the bustle of the city with its 433 luxuriously appointed rooms and suites. 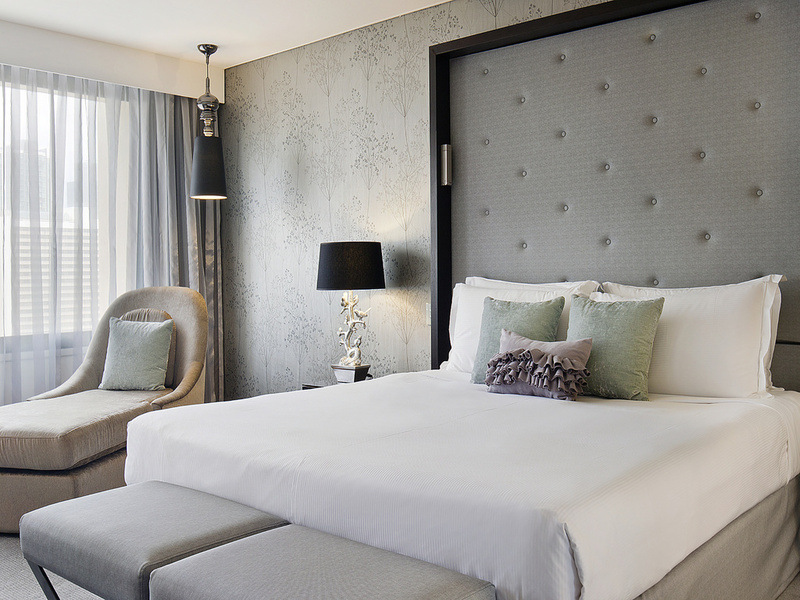 Every room exudes an artistic feel that seamlessly blends contemporary design with refined French elegance. 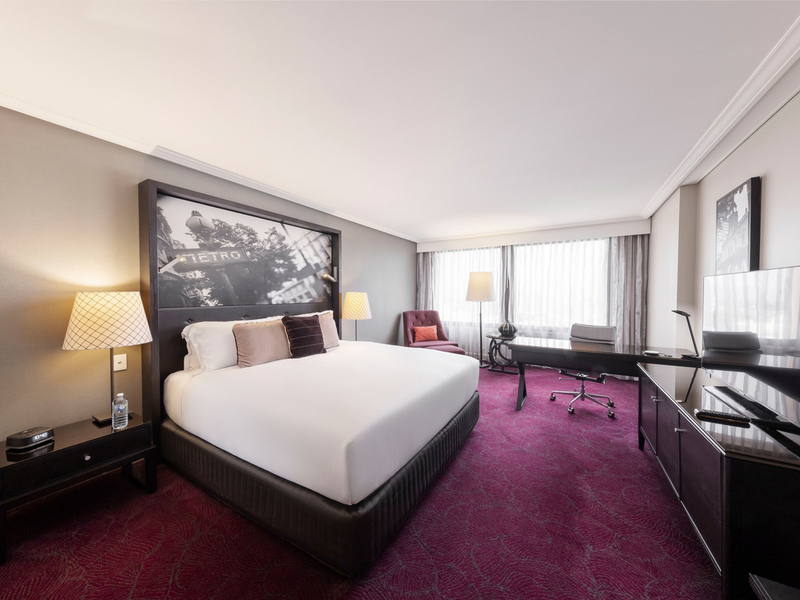 Adorned in an inviting palette of neutral tones, charcoal accents and rich chocolate hues, each room is designed to create a welcoming feeling complemented by the finest French amenities and sumptuous Sofitel MyBed collection. Discover your ideal room or suite below. 32 SQM / 344 SQFT, Hinterland View, Work Space, Sofitel MyBed, Lanvin Bath Amenities, Complimentary Wi-Fi Access, LCD Television, Mini-Bar and 24 Hour Room Service, Additional Roll Away Bed or Cot Available Upon Request. 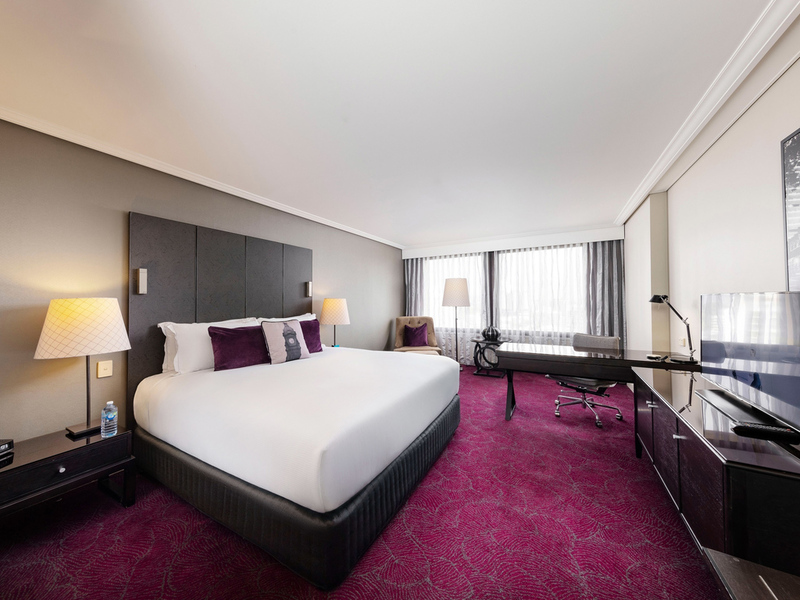 32 SQM / 344 SQFT, Anzac Square View, Separate Work Desk, Sofitel MyBed, Lanvin Bath Amenities, Complimentary Wi-Fi Access, LCD Television, Espresso Coffee Machine, Mini-Bar and 24 Hour Room Service, Additional Roll Away Bed or Cot Available Upon Request. 32 SQM / 344 SQFT, Sofitel MyBed, French sparkling wine on arrival, Espresso coffee machine, Complimentary Wi-Fi, Flatscreen TV, Turndown service, Rollaway/cot available upon request. 32 SQM / 344 SQFT, Sofitel MyBed, Espresso coffee machine, Complimentary Wi-Fi, Flatscreen TV, Turndown service, Rollaway/cot available upon request. 63 SQM / 678 SQFT, Separate bedroom / lounge room, Marble bathroom, Sofitel MyBed, French sparkling wine on arrival, Concierge experience box, Espresso machine, Complimentary Wi-Fi, Rollaway / cot available upon request. 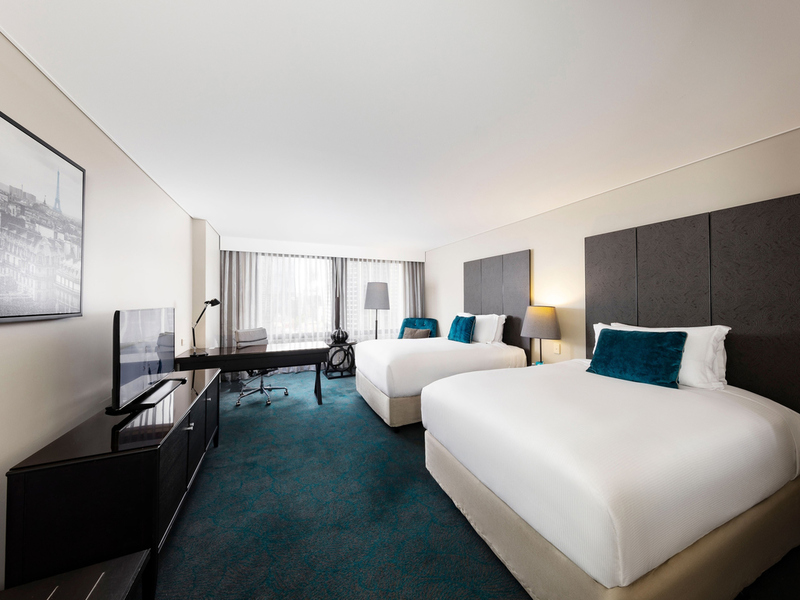 Enjoy the premier services of a hotel within a hotel as a Club Sofitel guest staying in any of Sofitel Brisbane Central's executive floor rooms or suites. Club guests gain exclusive access to the largest executive lounge in Australia. A spacious retreat for business or quiet reflection with breathtaking views over the city skyline, the Club Sofitel lounge serves spectacular complimentary breakfasts, afternoon tea, evening cocktails with canapes and all-day refreshments. Thyme² Restaurant delivers a unique buffet dining experience featuring market fresh product for breakfast, lunch and dinner daily while Privé249 offers relaxed, refined a la carte dining with exquisite views over Brisbane City. A secluded and relaxed à la carte dining experience surrounded by contemporary décor and breathtaking Anzac Square views. Enjoy locally sourced market fresh seafood, international cuisine and decadent desserts created in our very own patisserie. Indulge in a variety of quintessential French high teas while admiring the sweeping views of Brisbane's skyline from your vantage point in Cuvée Lounge Bar or Club Sofitel. A unique buffet dining experience, overflowing with market fresh seafood, exquisite international cuisine, interactive cooking stations and decadent desserts created in our very own patisserie. A relaxed bistro and bar with extensive gaming facilities, including Keno, TAB and poker machines. Sports enthusiasts can enjoy Fox Sports channels across a number of televisions throughout the bar. As Brisbane's largest hotel conference facility, Sofitel Brisbane Central provides guests with tailor-made meetings and events with our signature French touch. Set the stage in one of our 15 modern and stylish event spaces, capable of catering from 10 to 1100 delegates in a variety of styles. With our dedicated events specialists and the added convenience of our in-house audio visual technicians, organising an event of any size is made easy from start to finish. Providing the perfect setting for sophisticated Brisbane weddings, Sofitel Brisbane Central features an extensive array of versatile event spaces, wedding packages, tailored options, exceptional accommodation, and outstanding service and facilities. Sofitel's elegant function rooms offer unparalleled Brisbane wedding venues, supported with gracious five star service. For the most extravagant events, Ballroom LeGrand welcomes up to 650 guests for a banquet-style reception. Your wedding guests enjoy an amazing location in the heart of Brisbane. Sofitel Brisbane Central is directly connected to Central Station, linking the hotel by rail to the airport and a dozen rail lines spanning across the city and surrounding areas. Embark on healing journeys in an award-winning Brisbane spa. Enter the sanctuary of Stephanies Spa Retreat to explore a menu of Tibetan Thai and hot stone crystal massage, lavish skin treatments and the sensory indulgences of the Opal Rasul Steam Room. Taking advantage of Brisbane's enviable weather and premium city location, the hotel's stunning rooftop pool and spa offer a relaxed, chic oasis above the bustle of the CBD below. Work out in spacious SoFit gym with panoramic views of the river city. The innovative Virtual Gym Instructor offers interactive touchscreen direction on the state-of-the-art-equipment and fitness routines.